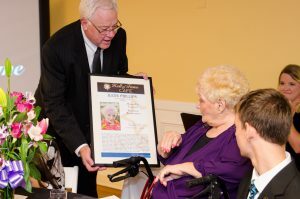 Louisville, Ky. – October 30, 2018 – For 15 years, the Hall of Fame at Signature HealthCARE has celebrated the stories and accomplishments of long-term care patients and the people who choose to serve them. Across 10 states today, Signature’s Hall of Fame is growing with the stories of accomplished patients, elders, stakeholders, volunteers and community leaders. “It’s important that future generations and future healthcare leaders hear these stories,” said Angie McAllister, Signature’s Director of Cultural Transformation, said. Inducted into this year’s Hall of Fame are nominees from age 13 years old to 104 years old and with accomplishments including: World War II, Korean War and Vietnam veterans and award-winning nurses, CNAs, and other healthcare leaders. These are only a few of their stories. Coy Booker is a devoted volunteer and leader in his eighth-grade class. He will be inducted into Signature HealthCARE of Colonial’s Hall of Fame. Bob Steele served in the military during the Korean War, received the National Defense Medal and was awarded the Navy Service Medal in 1956. He will be inducted into Signature HealthCARE of Jacksonville’s Hall of Fame. Charles William Gill served in the U.S. Army during World War II as a Tech Sergeant and is the last charter member of the Little League Football Program. He will be inducted into Signature HealthCARE of Coshocton’s Hall of Fame. Nelda Wade, a Certified Nursing Assistant of over 32 years, was awarded the Orange County Department on Aging Outstanding Direct Care Worker Leadership Award. She will be inducted into Signature HealthCARE of Chapel Hill’s Hall of Fame. Terry Durham received the Social Services Worker of the Year Award from the Tennessee Health Care Association and the Caring More Award from Crossroads Hospice. She will be inducted into At Signature HealthCARE of Memphis’ Hall of Fame. Billy Weaver served in the United States Army during the Korean War and was one of the very first members of the Army’s elite fighting force, the Green Berets. He will be inducted into Signature HealthCARE of Erin’s Hall of Fame. James Wilson is a veteran of the United States 101st Airborne Division and served during the Allied invasion of France in 1944. James is 100 years young and will be inducted into Signature HealthCARE of Hillcrest’s Hall of Fame. Molly was a beloved furry friend to dozens at Signature HealthCARE of Bowling Green where she will be inducted into their Hall of Fame. Hall of Fame inductees are nominated by these categories: academia, author, community involvement, military servicemen, entrepreneur, founder, journalism, leadership, personal accomplishments, professional accomplishments, public service, sports, theater and entertainment and volunteerism. This entry was posted in Uncategorized on October 30, 2018 by ccrenshaw. Louisville, Ky. – October 11, 2018 – Celebrating Signature HealthCARE day in Louisville, the company is marking its eighth anniversary with headquarters in Kentucky. The Louisville Metro Council, then-Jeffersontown Mayor Clay Foreman and then-Louisville Mayor Jerry Abramson proclaimed October 11 as Signature HealthCARE Day in 2010. “We moved to Louisville in its infancy as the center for aging care to pioneer more advancements for our patients, and we will keep dreaming new innovations for the years to come with our passionate stakeholders and partners across the city,” Joe Steier, Signature’s CEO and President, said. Since 2010 and relocating its headquarters to Louisville, the country’s aging care capital, Signature has continued innovating across the continuum of care. 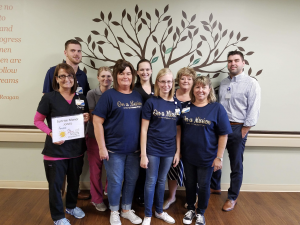 From inspiring multiple spin-off affiliates to growing CNA’s careers in the Pinnacle program, the company keeps doubling down on its commitment to serve both its patients and its stakeholders with more joy. Signature is also leading the culture change movement in the long-term care industry with over 50 locations currently added to the national Eden Alternative Registry, over 102 locations accredited through Providigm’s Quality Assurance Performance Improvement (QAPI) program and eight locations on the 2016-2017 US News & World Report Best Nursing Homes List. This entry was posted in Uncategorized on October 10, 2018 by ccrenshaw. Louisville, Ky. – October 8, 2018 – During October, Signature HealthCARE is taking the time to bring attention and to raise awareness of mental health across the country. Mental health includes our emotional, psychological, and social well-being affecting how we think, feel, and act. It also helps determine how we handle stress, relate to others, and make choices. For caregivers, mental health is important so that they may continue serving others. There are many ways in which caregivers can improve their mental health. Behavioral health experts at Serenity, a Signature division, share six tips for caregivers’ daily self-care. Go Outside! – Take a walk. Go for a jog. Sit in a garden or courtyard. Being outdoors provides therapeutic benefits that provide a mood boost and provide individuals with a sense of connectedness to nature. Adventure outside and enjoy the weather. Use Humor! – Tell a joke. Watch a comedy. Read a funny book. Laughter is the best medicine and provides an instant mood boost! Laugh it up! Dance! – Shaking your booty doesn’t just make for a fit physique. It may also improve both mood and body image, lead to a better outlook, is associated with a lower risk for dementia, and even help you make friends. Listen to Music! – Music has the power to instantly change a person’s mood. Additionally, listening to music helps to strengthen learning and memory, helps to reduce signs and symptoms of depression, and provides people with an extra boost of energy. Meditate or Pray! – Meditation and prayer are proof that it doesn’t take a ton of time to do a mind and body good. Just a few minutes of quieting your mind can help relieve stress. Other benefits include a boost in compassion and emotional stability, and some research suggests that meditating and praying could even keep winter illness at bay. The best part? The benefits continue even when we’re not meditating and praying. It is the gift that keeps on giving. Find a few moments each day to get away from everyone and everything to sneak some meditation and prayer into your day-to-day life! Curse! – Research also shows swearing can reduce physical pain and may even boost confidence and self-esteem. But, as they say, timing is everything—so be sure to filter your expletives to avoid adding embarrassment to stress. This entry was posted in Uncategorized on October 8, 2018 by ccrenshaw. 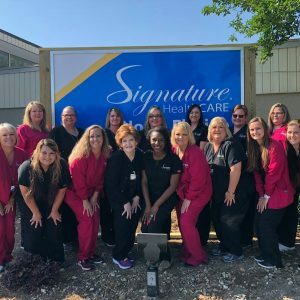 Louisville, Ky. – October 3, 2018 – Signature HealthCARE, one of the largest healthcare and rehabilitation providers in the United States, announced it has chosen HealthcareSource, the leading provider of talent management solutions for the healthcare industry, for its talent management platform. Signature HealthCARE serves the entire continuum of healthcare including rehabilitation services, home health, assisted living, skilled nursing, and cognitive care. The company is headquartered in Louisville, KY, with 115 locations in 10 states and over 17,000 employees. Inc 5000 most recently recognized Signature HealthCARE on its list of fastest-growing private companies in 2017. This entry was posted in Uncategorized on October 3, 2018 by ccrenshaw. 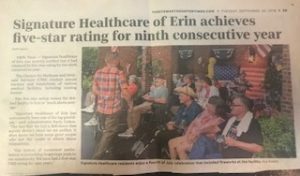 Louisville, Ky. – October 3, 2018 – The Centers for Medicaid and Medicare Services recently awarded its highest rating to Signature HealthCARE of Erin for the ninth consecutive year. The distinction is a rare accomplishment in an industry where regulations and rules are prioritized, and yet the team at Signature HealthCARE of Erin continues pioneering person-centered care and other care innovations. “We know that the Signature revolution translates into meaningful clinical results and positive quality of life improvements for our residents. To have CMS continually recognize Signature HealthCARE of Erin is exciting. Only with each of our committed stakeholders, from nurses to CNAs, do we make a difference each and every day,” Barry Cotton, CEO at Signature HealthCARE of Erin, said. Under the five-star rating system, nursing homes are assessed in three main categories: health inspections, quality measures and staffing. The overall rating combines scores received in each of the three categories. 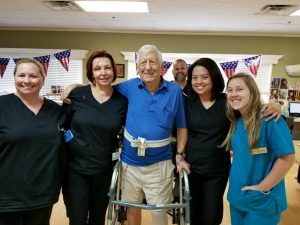 “Even without recognition, our staff serves our patients each day with compassion and joy and provides ongoing support for their families and caregivers,” Cotton said. The center offers comprehensive behavioral services for dementia, Alzheimer’s disease and related disorders. Additional services include physical, occupational and speech therapies; a full-time chaplain and spiritual programming; vibrant quality of life/activities programming; and more. Signature HealthCARE of Erin is also named to the international registry of Eden Alternative homes, a national list of nursing homes and rehabilitation centers taking a different approach to healthcare by embracing person-centered care at each level from staff development to clinical care procedures. Communities on the Eden Alternative Registry embracing person-centered care experience less staff turnover, according to data from a survey of 2011-2016 members of the registry. This entry was posted in Uncategorized on October 2, 2018 by ccrenshaw. Louisville, Ky. – October 2, 2018 – When the Vietnam Traveling Memorial Wall came to Tompkinsville, Kentucky, the team at Signature HealthCARE of Monroe County mobilized to make an outing reality for their residents. Standing at six feet tall and a 3/5th scale of the Vietnam Memorial in Washington DC, the traveling wall came to Tompkinsville in Monroe County this weekend with the names of over 50,000 who lost their life during the Vietnam War. Signature HealthCARE of Monroe County attended the wall’s opening ceremony and visited with old friends. One resident of Signature HealthCARE of Monroe County, Tex, served in the army for one year and three months. There were tears shed when the name of one of Tex’s best friends, who was killed in the Vietnam War, was announced. For Tex, seeing the names on the traveling Vietnam Memorial Wall meant the world to him. He said that he was very glad that he got to go see it, because he would never get to make it to see the memorial in Washington D.C. during his lifetime. Louisville, Ky. – September 27, 2018 – When Agnes Taylor came to Signature HealthCARE of Newburgh, she didn’t want to change her life motto, after all, it has inspired her through 80 birthdays. 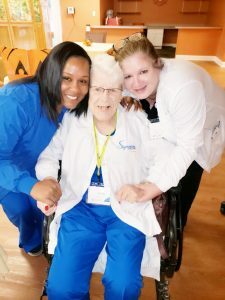 Agnes has enjoyed working all of her life, because in her words, “It gives her purpose.” The team at Newburgh went to work making sure Agnes could continue living out life with purpose. Stakeholders Latoya and Denise presented Agnes with a nurse’s uniform and special name tag – just for her. Agnes has even accepted a position supervising the second shift at Signature HealthCARE of Newburgh where she is proud to tell stakeholders to get to work with a little sparkle in her eye and a giggle behind her smile. This entry was posted in Uncategorized on September 27, 2018 by ccrenshaw. Louisville, Ky. – September 30, 2018 – Friendships make a difference for our residents and Signature communities across the country. From shared experiences to differences to creating new memories together, volunteers vibrantly serve others, and Operation Volunteer is mobilizing even more. Operation Volunteer invites members of the community to consider cultivating a friendship or to share their talents with Signature residents and elders. “Humans are social beings by nature, so these volunteers serve a valuable role for our elders, some of who do not have family visiting. No talent is too small to share, and everyone can join in some way, even families,” David Baumgartner, Signature HealthCARE’s Vice President of Spirituality, said. 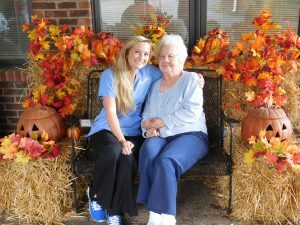 At Spring City Care and Rehabilitation Center in Tennessee, Mary, a new volunteer, visits on weekends and joins in meals and Quality of Life activities. “I always love to get those that you can see really wants to make a difference in this world,” Debbie Early, Quality of Life Director at Spring City, said. Operation Volunteer even sparked Hermitage Care & Rehabilitation Center and Signature HealthCARE at Hillcrest to partner with Kentucky Wesleyan College’s Volunteer Fair. The James 1:27 Mission Project personally matches volunteers with elders based on similar interests creating opportunities for relationships to bloom from the beginning. 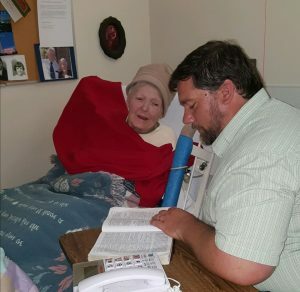 In one month alone, James 1:27 volunteers personally visited with elders on over 130 occasions at Riverside Care and Rehabilitation Center in Calhoun, Kentucky. And with Operation Volunteer, the project is growing. 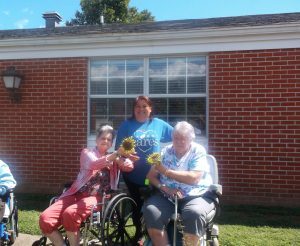 Sunrise Manor recently launched the James 1:27 Mission Project. “Everyone needs a friend, and James 1:27 volunteers fill a need for many of our elders,” Donovan Dame, Administrator at Sunrise Manor Nursing Home, said. James 1:27 volunteers contribute to the community at Signature HealthCARE of Bowling Green. 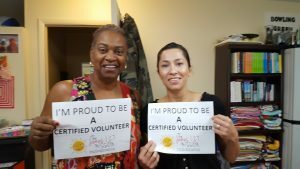 Those interested in becoming a volunteer at a Signature HealthCARE community or a certified James 1:27 volunteer can apply at SignatureVolunteer.com.